In the tumultuous years since the US-led coalition’s invasion of Iraq and the fall of Saddam Hussein, the country’s media landscape has changed dramatically for everyone–including political cartoonists. 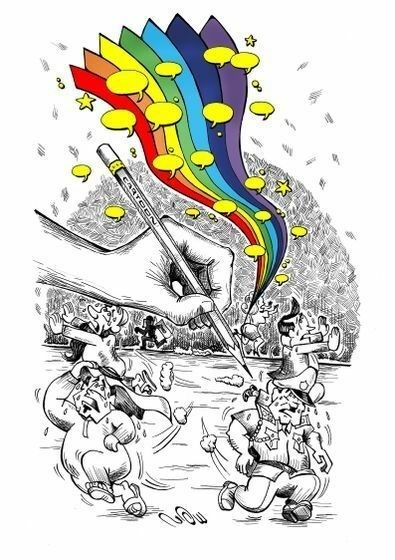 In a recent interview from the online magazine Sampsonia Way, cartoonist Saad Murtadha discussed what’s changed, the difficulties he still faces, and his vision for the future of cartooning in Iraq. Murtadha told Sampsonia Way’s Caitlyn Christensen that while the media is no longer strictly monitored by the government as it was prior to 2003, independent cartooning has not exactly blossomed in the mainstream press. Most paid cartoonists are affiliated with particular political parties, he explains, so their work must always toe the line drawn for them. Cartoonists who prefer to express themselves more freely do so on their own time and share their work via social media and other unremunerated online outlets; Murtadha himself makes a living as a service technician and engineer. Yes, I have censored my cartoons. I have had many ideas to attack politicians personally, but I was afraid for my family. I had to change their faces, or maybe post the cartoon and delete it after couple of days. As a Muslim, the first word in our holy book is ‘read.’ Reading and studying is the most important thing for any nation or country. If the government neglects its schools, we will have a generation of extremists and radicals. This is the current situation in many Middle Eastern countries. Children have the right to read and grow up in schools, not in the street and not in war zones. Already Iraq is lucky to have cartoonists like Murtadha who are so eager to share their views that they will devote much of their own time and money to a potentially dangerous craft. Hopefully as the country’s independent media continues to develop, it will soon carve out space for full-time cartoonists who are not beholden to any party.